Keith Ingram Dismuke, II (Ingram) is three-and-a-half years old, and is battling anaplastic ependymoma. His father gave him the name Ingram the Conqueror when he was two years old because he loved to conquer towers of blocks (or destroy, but Ingram the Destroyer seemed unbecoming for a two year old). Now, his name has taken on new significance. Ingram loves to play any kind of sport although he seems to prefer baseball, no matter what equipment he has. He also loves to play soccer and dance to Justin Bieber songs with his girls (Madison will want us to clarify that she doesn't like Justin Bieber). 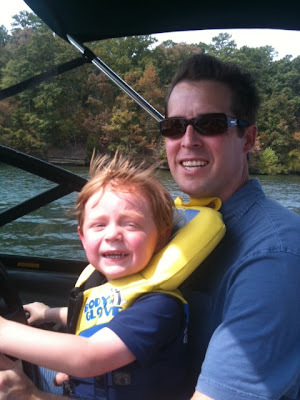 However, nothing can compete with Ingram's love of driving the boat, really fast. Ingram brings joy to people everywhere he goes, making many friends along the way. We are pretty sure the only person he has met who doesn't necessarily like him was the older, larger woman at Costco whose rear-end he patted out of the blue. It was cute in an entirely embarassing sort of way so long as you aren't his parent and you aren't the lady getting patted. We pray that, with God's power, Ingam will conquer this battle. Please pray that God would heal his body.